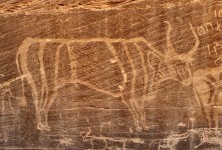 The domestic cattle depicted in Saudi rock art are similar in appearance to those shown in Egyptian art from the New Kingdom. Their horns are relatively long, lyre-shaped and more or less vertical. There is often a small bump at the shoulders most likely reflecting elongated thoracic spines, rather than a true hump like that found in Zebu cattle from India. Ears, if shown at all, are small and do not droop like those of the Zebu. 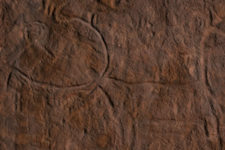 The bodies of the cattle in the rock art show numerous patterns, some of which may be attempts to indicate coat patterns on the living animals. 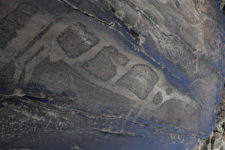 Some have spots, or stripes or even very complex geometric patterns on the torso. These more complicated designs could be elaborations of spotted pelage patterns or, alternatively, could represent designs actually painted on living cattle. 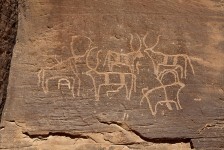 Domestic cattle have a broad geographic distribution in Saudi rock art, but the most dramatic images are found at several localities in the Bir Hima area. 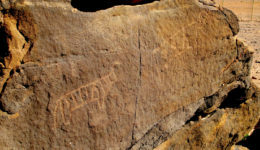 They appear to date to before writing was developed, so prior to 1,000 BCE. 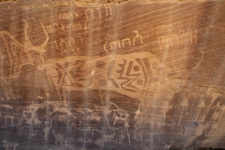 Some script is present adjacent to images of cattle, but, based on differences in the patina, it was most likely applied later. 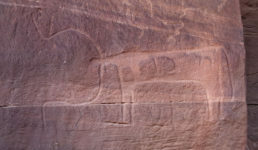 Camels and date palms on the “Painted Bull” panel at Bir Hima could possibly be contemporaneous, but generally cattle are not associated with either. 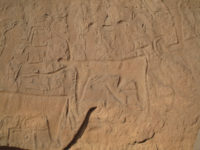 Likewise, it is clear that the cattle date to before when cavalries and battle scenes dominate at Bir Hima in the last half of the first millennium BCE. 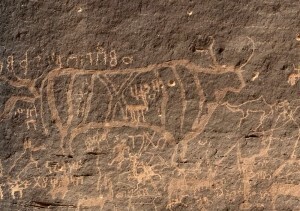 At A’abar Harema, an older bull that is deeply incised and heavily patinated, lies under the more recent battle scene. 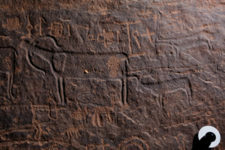 Based on these observations, cattle images must have been created in the second millennium BCE or even considerably earlier. 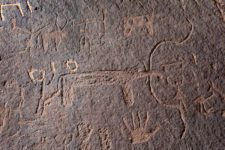 A scene of two fighting bulls painted on an Egyptian limestone ostracon shows designs on their bodies that are remarkably similar to those on some of the bulls in the Bir Hima region. This piece, from the collection of the Metropolitan Museum of Art, is estimated to date to the Ramesside period, ca. 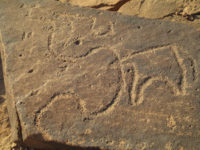 1295-1070 BCE.